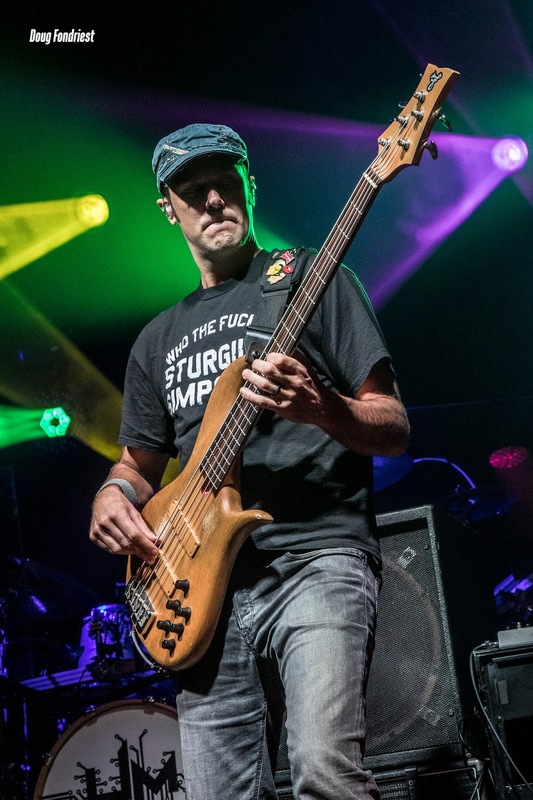 To close out 2017, jam stalwarts Umphrey’s McGee again descended upon Denver for their 3rd New Year’s run at the Fillmore Auditorium. For the first night of the 3-night run, the band tapped up-and-coming jammers Aqueous for support. This tasteful pairing meant that the evening began with a delightfully proggy Aqueous set, filled with bold improvisation and creative reinterpretations of their composed material. After watching this, the members of Umphrey’s responded in-kind with a blistering first set of progressive material, before masterfully dialing back the tempo with a second set that tended more towards groovy jazz. 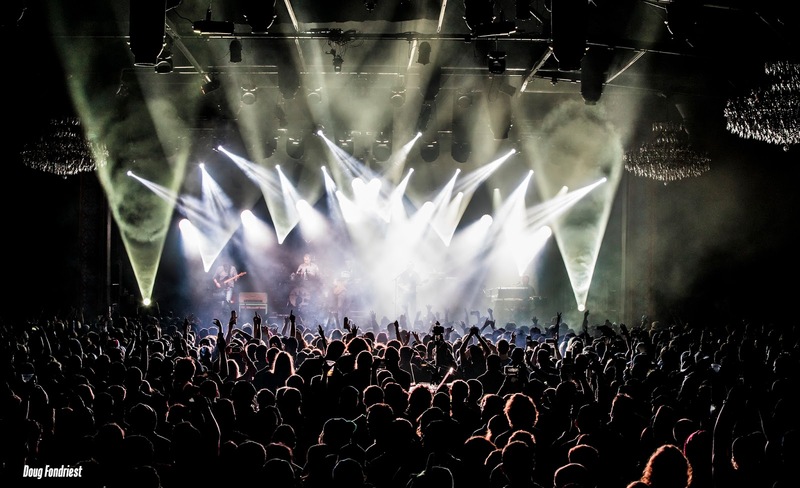 In order to make sure they had an entire hour to work with for their set, Aqueous took the stage early at 7:45 p.m. to a sparse crowd in the enormous venue. A steady flow of fans trickled past the security inspection throughout their set. As they began, the crowd chattered idly with a typical disregard for the opening band, until guitarist Mike Gantzer stepped up for his first solo of the evening. His soulful approach to the instrument rapidly quieted and captivated the uninitiated listeners, retaining their attention as the group moved forward into their set. Four diverse originals comprised the hour-long block, which is a typical breakdown for an AQ set. During this entire set, I was particularly impressed with how comfortable the band was switching from composed sections to improv and back, and by how frequently they did so. 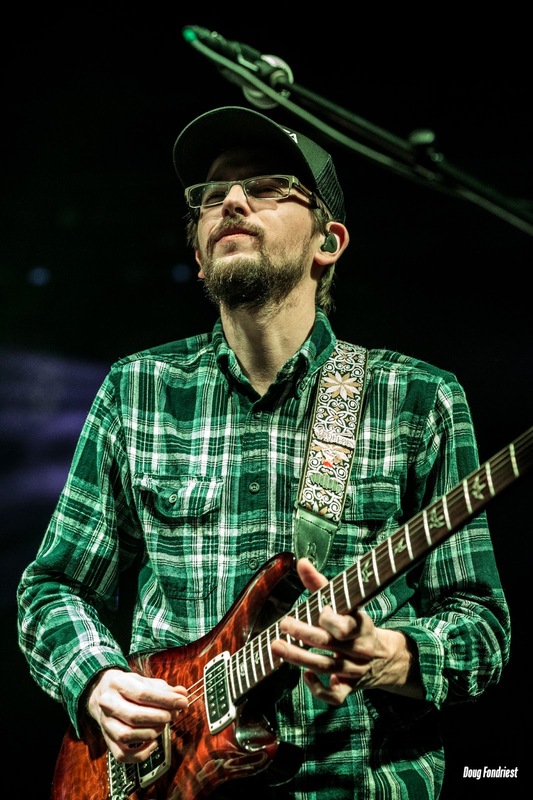 While most jambands will generally have one or two large improv sections in the middle of a composed song, Aqueous seems to prefer to hop in and out of the composition at will, splitting the jam into several smaller sections that still build off each other. Bassist Evan McPhaden tastefully nudges the band from section to section, with drummer Rob Houk never a step behind. Dave Loss playing keys and guitar really helps to open up sonic options for the quartet, with his additions on clavs and synth serving as nice breaks in the more typical dual-lead guitar action. 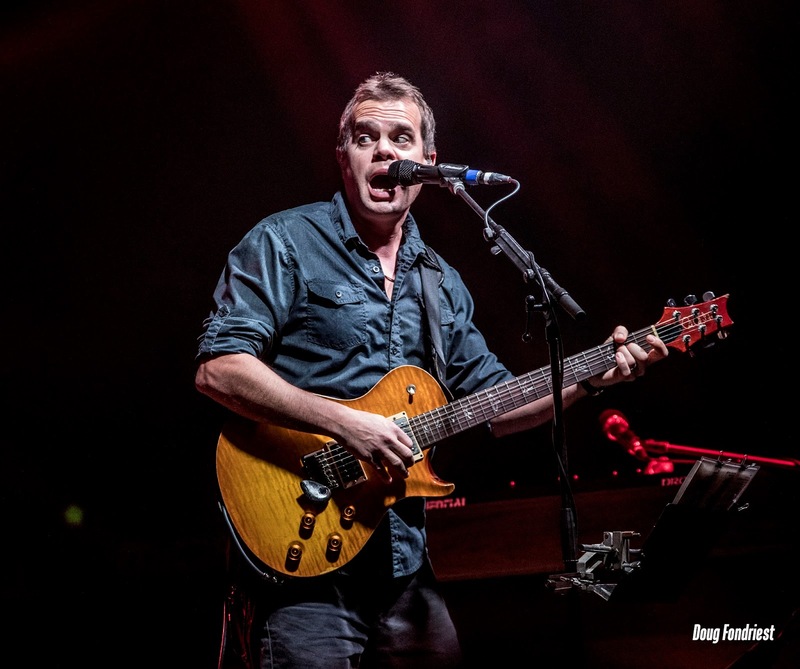 It’s pretty amazing to hear Umphrey’s and moe. inspired dual-lead guitars with the innate tightness and trust of a smaller ensemble. I think that, while all of these bands can flat-out jam, this aspect of their sound is what really sets them apart from contemporaries like Dopapod, Twiddle and Spafford. Umphrey’s took the stage and their first set was just the type of barn-burner you always know will fall somewhere in a run like this. Listening to Aqueous seemed to inspire the band to go heavy right off the bat. The rarely played “Padgett’s Profile” really got things going early with some fun industrial prog licks, and it led nicely into the explosive instrumental section of “Walletsworth.” These two were light on improv, but the subsequent “Sociable Jimmy” was another story entirely. This jam saw the band blur the lines between composition and improvisation by utilizing a composed song structure with A and B sections. At the time, my mind was blown by their confident sound during this section. Later, everything made a bit more sense when keyboardist Joel Cummins and bassist Ryan Stasik used Twitter to explain the pre-composed aspect of the jam. Although using composed song elements in jams removes some of the improv/risk-taking element, I have trouble arguing with the results of this one. With tasteful application, these structures can serve as a scaffolding for unique sonic explorations, and this jam is a concise testament to that. 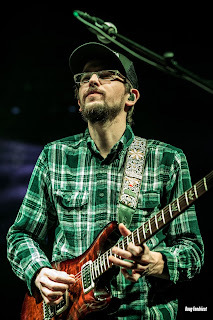 Keeping the energy high, the band worked their way into their classic instrumental, “The Fussy Dutchman.” I always love a chance to see guitarists Jake Cinninger and Brendan Bayliss chasing each other up and down the fretboard during this blissfully shreddy section of the show. After slowing things down for the next two songs, they picked that vibe back up again, this time with the explosive metal riffs of “Bridgeless” closing the set. The second set saw the band dial back the intensity in a way that only they could pull off. After a proggy, even metal-tinged first set, they fell back into a downtempo groove with more jazz-inspired songs that provided just the variety that the evening needed. The turning point of the entire show was the drop into “Night Nurse,” which relaxed the vibes considerably and got me grooving, rather than thrashing. This was a recurring theme, with tunes like “Yoga Pants,” “Syncopated Strangers” and “Draconian” pushing things further in the direction of jazz-funk downtempo grooves. This stark contrast with the first set brought a nice wrinkle of depth to the performance. The band encored with a cover of Pink Floyd’s “Comfortably Numb,” with lighting designer Jefferson Waful throwing out a curveball with his use of a full complement of lasers onstage. While standalone cover encores aren’t typically my preference, this one knocked it out of the park. The delivery of the song was good, but Jake’s delivery of the song’s guitar solo was truly special. He stood alone at center stage, surrounded on all sides by lasers, and ripped David Gilmour’s most iconic solo. True to form, he nailed it by adding lots of flourishes and extra notes, and even a few mistakes because of this. It was an endearingly ‘rock n’ roll’ ending to a quality show to start off the New Year’s run.